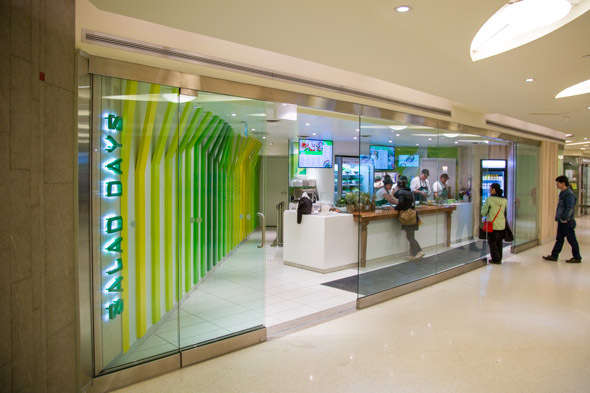 Salad Days has opened a second location at the Bloor and Yonge concourse, which is pretty much on the same turf as where it began in the Cumberland food court. Usually doubling up so close would be impractical or foolhardy. But from what I've seen and heard, their devoted following is only growing. New evening hours and the nearby subway entrance no doubt helps too. Shakespeares need not apply. Their salad assembly line is too forthright, uncomplicated, and matter-of-fact to bother with bittersweet idioms. Except for the clean and shiny design work reminiscent of Picnic down the way, Salad Days forgoes undue embellishment. What you see is what you get: remarkably cheap pricing, quick and friendly service, unpretentious presentation. 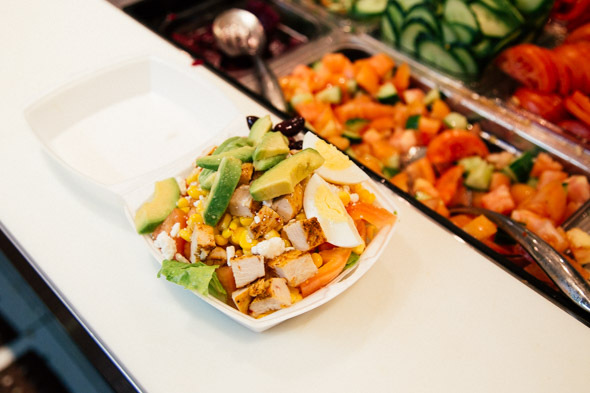 Even those green in their judgment when it comes to city eating will appreciate the wallop of a meal you get at Salad Days. Made to order, there's nothing pre-packaged, and they take obvious care in their product. You won't find a wilting or blotchy leaf in the bunch; each bite is clean and crisp. The dizzying amount of menu options can be overwhelming, but there's a way to keep things manageable. The most popular features are listed first. I'd recommend starting with those and branching your way out. 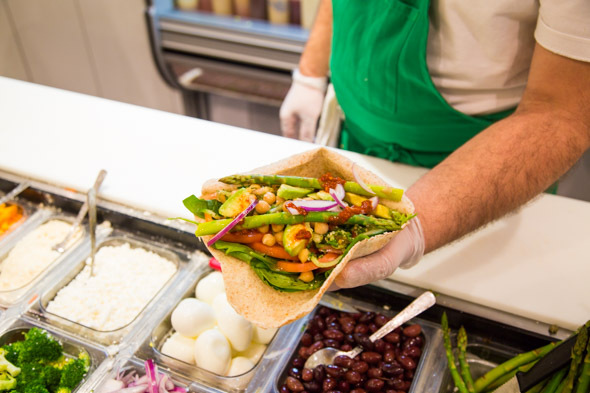 Plus you can customize any of your orders for a nominal extra fee, and any salad can be had in wrap form as well ($4.50 to $6.20). You have your caprese, your tabouleh, your apple & beet salads ($4.50 sm; $6.50 lg). Their take on the cobb salad though ($4.70 sm; $7.80 lg) is the runaway favourite. Seasoned grilled chicken breast is sliced and diced with wedges of ripe avocado and perfectly hardboiled egg. Corn, tomatoes, and feta join the fray on some iceberg, making for some serious heft. For a 'small' serving you could realistically get two meals out of it. Their house special salad ($5.99) is another go-to alternative. Coming in a default large size makes it perhaps the best deal on the board. 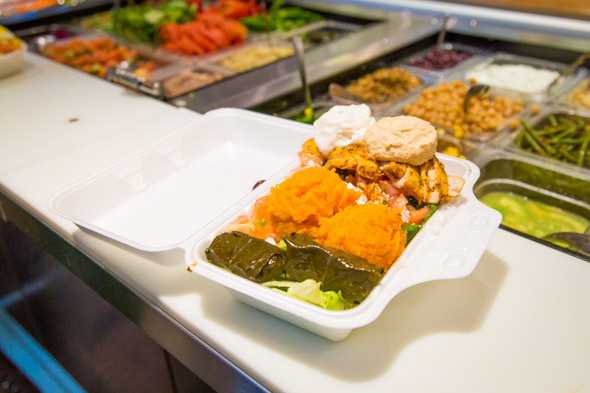 You can go for chicken breast or salmon, and it comes with Greek salad, stuffed vine leaves, mounds of sweet potato mash, and hummus for good measure. If you're still stuck, their Salade niรงoise ($4.70 sm; $6.80 lg) is quite satisfying. 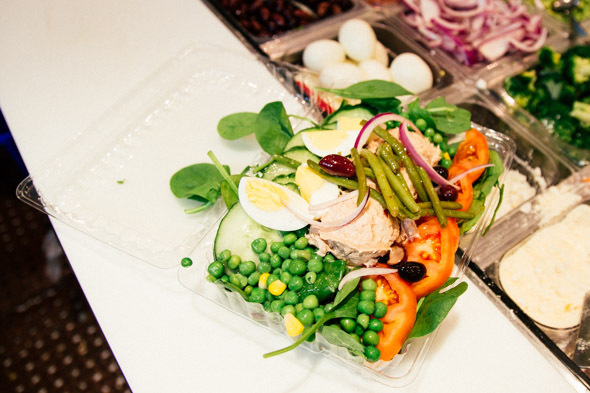 Delicious creamy scoops of tuna stand out on this spinach salad, which as with the cobb, is loaded with ingredients and utterly fresh tasting: green beans, tomatoes, peas, cucumbers, slivers of red onion, more egg quarters, and a light vinaigrette. 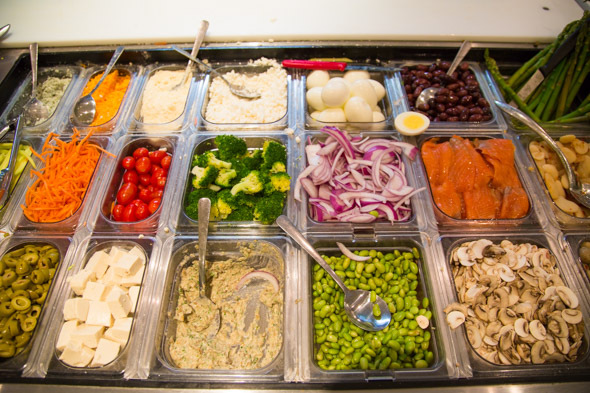 If you're looking for a healthy dose of healthy food in and around the PATH at Yonge and Bloor, Salad Days is a solid option.